If you consistently toss your empty water bottles or soda cans in one of the recycling bins around the Texas Tech University Health Sciences Center El Paso campus, you have reason to feel good about yourself. Not only are you protecting the planet by keeping recyclable materials out of landfills, but you are also ensuring the university’s Alan Nasits Go Green Recycling Program keeps going strong. Go Green representatives said the university community’s efforts to recycle plastic, metal, cardboard, paper and other materials has kept nearly 400,000 pounds of waste out of landfills over the life of the program, now in its fifth year. And the sale of materials to recycling companies has generated $25,000 in revenue to date. The money is used to cover program costs and continue its expansion. As the university grows, Go Green adds recycling bins to locations across the university and its outlying locations. It’s easy to spot Go Green recycling bins in meeting rooms, break rooms and common areas across campus. To get the word out about the program, university departments have staff designated as “Greenies.” These are Go Green volunteers who educate their coworkers about bin locations and the best ways to recycle. A major challenge for the Greenies on our rapidly growing campus is bringing new employees up to speed on the Go Green program. “We get new employees all the time… there are people who come onto campus who don’t even know the program exists,” said Go Green committee member Cathy Olivas, who also holds a position in the Office of General Counsel. At the Go Green committee’s fifth annual luncheon on Oct. 23, Olivas and others brought the Greenies up to date on the program’s achievements. Greenies were encouraged to keep up their efforts to get everyone on campus to recycle. “Whenever you have a meeting in your department, let people know about the Go Green program,” Olivas said. 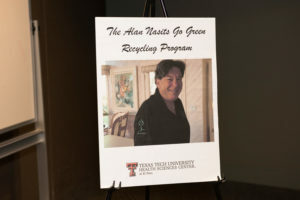 TTUHSC El Paso’s Alan Nasits Go Green Recycling Program, named in honor of Alan Nasits, former general counsel and lifelong “Greenie,” has kept over 400,000 pounds of waste out of landfills. Also in attendance was Mary Nasits, wife of Alan Nasits, who was instrumental in launching the Go Green program in September 2012. The former general counsel passed away unexpectedly in December 2012. “Alan would always say, ‘It’s not what you are doing for TTUHSC El Paso—it’s what you’re doing for the whole world,’” she said. The university officially named the Go Green program in honor of Alan Nasits in November 2014. Get to know your department’s Greenie. Don’t place trash that is not recyclable in the recycling bins. Check for the recycling symbol on the package to determine if an item is recyclable. Rinse/remove drink and food residue from recyclables before placing in the bins. Glass should never be placed in the bins. The recycling program does not accept glass. Collapse all cardboard boxes before leaving them out for custodial personnel to pick up. Departments should make an effort to shred as much of their own paper as possible. Used batteries can also be recycled—contact your department’s Greenie for battery recycling guidelines. 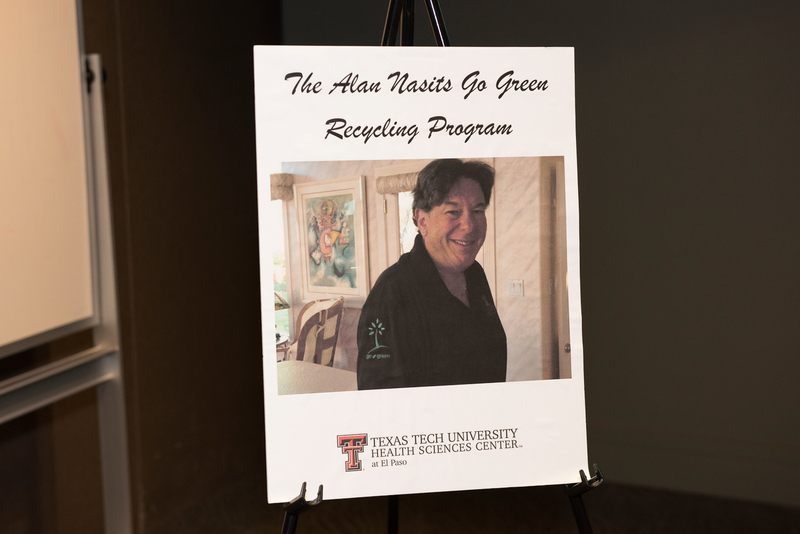 For more information about the Alan Nasits Go Green Recycling Program, contact Cathy Olivas at 915-215-4437 or cathy.olivas@ttuhsc.edu; or contact Facilities Operations and Maintenance at 915-215-4500.